L’Opera dei Pupi, the puppet theatre appears in Sicily in the first part of 19th century and enjoyed great success among the popular classes. The puppeteers represent stories from medieval chivalric literature and Italian poems of the Renaissance. There are tree different puppet schools in Sicily, Palermo, Catania and Siracusa. The three schools use different sizes, shapes and colors in the realization of the pupi and backdrops, as well as differences in acting and texts. The theater were mainly family-run businesses passed down from generation to generation. The member of the family they took care of the carving, painting, and fabrication of the very refined puppets employing traditional methods and techniques. The puppet shows were spread over several evenings. This kind of theatre reflected the Sicilians’ feeling of belonging and their awareness of a common identity. Unfortunately after the war events this art was abandoned. technical progress, in particular the television, has turned many Sicilians away from these performances. Economic difficulties have also affected this traditional theatre form since many puppeteers can no longer make a living from their art. Fortunately, the Opera dei Pupi has survived and still today makes young and old dream. In Siracusa Several generations of pupari alternated over the past years, from the Vaccaro brothers to the Mauceri’s. 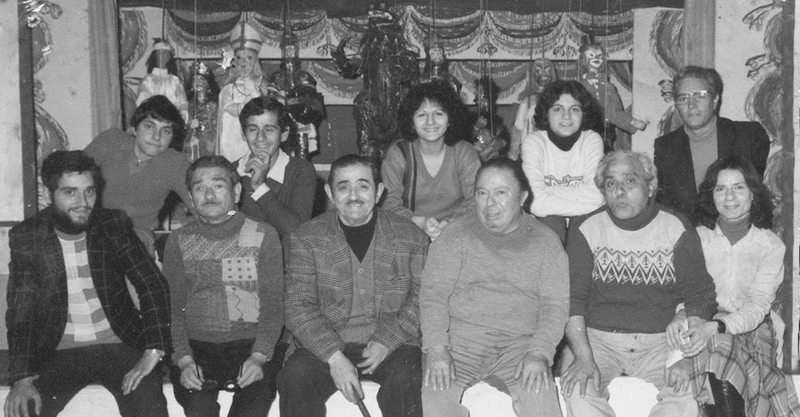 Family is the founding fulcrum of each opera dei pupi tradition, where it all rotates around the armed puppets: ancient rites used to accompany the gestures and the movements of the puppet masters, always surrounded by their wives and sons. The theater is the place where the family gets together both for the shows and for other family activities.